, , Sacrifice Blighted Steppe: You gain 2 life for each creature you control. 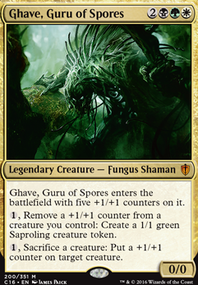 You might consider some land ramp for early Gishath on board: Rampant Growth , Farseek , Cultivate , Kodama's Reach , Explosive Vegetation , Circuitous Route , Ranger's Path , Skyshroud Claim and Hour of Promise will do it. 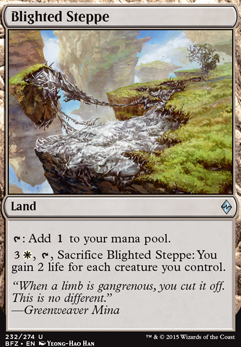 You might also consider swap some suboptimal lands for more basics: Blighted Steppe , Tranquil Expanse , Timber Gorge , Rugged Highlands , Vivid Meadow . I already have Glowspore Shaman, so it's no money out of my pocket to have it in the deck. Though, Stitcher's Supplier would work fine as well. 25 lands probably is too much with having Birds of Paradise as well. I could potentially replace Blighted Steppe with Verdant Catacombs. I'm not exactly sure what I was thinking there. I'm not sure if I really need more removal, but I do like Damnation. I might end up putting that in the mainboard. I also really enjoy Ghoultree. I could potentially replace Ghalta, Primal Hunger with it. Either that or possibly Molderhulk. But then I would have no way of retrieving lands sent to the graveyard by Glowspore Shaman. Let me know if you had a place in mind for it. I mainly like Greenseeker for its ability to help populate the graveyard and activate Grim Flayer's delirium state. 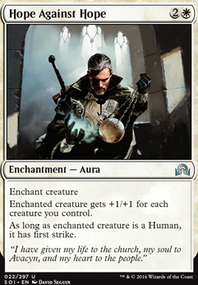 If I put Chromatic Lantern in the sideboard, I would have room for either Fatal Push or Damnation. I think I might actually lean more towards Fatal Push for its ability to combo with Bone Splinters. You've certainly given me a lot to consider, and I greatly appreciate your suggestions. Many thanks, friend. First of all, what's your budget? Other cards I don't like are Blighted Steppe and Greenseeker. Why should they be usefull here? All things I am going to suggest are under $2 cards. If your looking for something in a higher budget let me know. Add the following Lands. They will trigger Regna, the Redeemer the turn she comes into play. 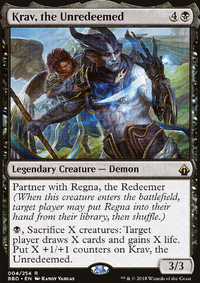 Arena Rector No really good planeswalker to find. Danitha Capashen, Paragon No Equipement but a decent creature. Pontiff of Blight, Syndic of Tithes, Tithe Drinker, Treasury Thrull, Soul Warden, Soul's Attendant, Sunscorch Regent, Suture Priest are all good examples. In multiplayer EDH extort good. Bloodgift Demon and Mentor of the Meek are good examples. You should have all your instants and sorceries do some kind of board wipe or removal. The ones that are a one shot gain life just aren't good. 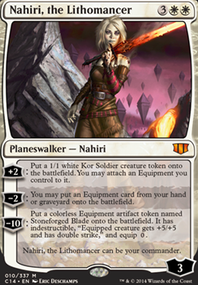 Artifacts should be replaced with mana rocks or mana reduction effects like Sol Ring, Commander's Sphere, Oketra's Monument, and Bontu's Monument. I think you'll want to up your lands to 23-25. Blighted Steppe/Kabira Crossroads help you out. Aven Riftwatcher is also a very good creature, it only last a few turns but is great for them, and I like Nyx-Fleece Ram. Survival Cache is a way for you to draw cards. Blighted Steppe would do wonders with all the creatures youll have. You might run into problems facing early AoE-damage, since all but one of your early game creatures have 1 toughness as long as you dont pull out your Archangel of Thune or Honor of the Pure fast enough. Maybe one or two Wilt-Leaf Liege would be a nice addition in that regard. 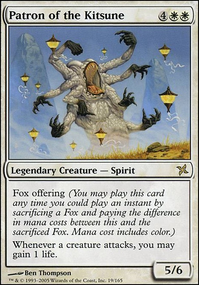 Westvale Abbey Flip is a cute idea, but the mana cost is far too high in my opinion + killing of 5 creatures (that are likely to have some +1/+1 counters on them at this point of the game) slows you down more than it benefits you I think. A great replacement for it would be Legion's Landing Flip. It's low cost, spawns you a lifelink minion and you have the possibility of another early mana source + more lifelink creatures for 3 mana. A nice maybecard could be Blighted Steppe if it goes late or you are struggling to activate your Serra Ascendant. As for creatures you might add, i think Lone Rider Flip is an option you might consider.